Every ad campaign Liquid Line creates is designed to flow seamlessly with your overall brand and goals. Whether the medium is print or digital, a high-volume location or a targeted contact list, we create fresh designs and message to reach your audience and get attention and results. Our designs are eye-catching and get noticed no matter where they appear. You don’t have time or money to waste on uninspired or uninteresting advertising. Because we simply love what we do, you’ll get the kind of campaigns that get you noticed. With seamless deliver from end-to-end, you’ll have confidence that every ad dollar is not only well-placed but well-designed. 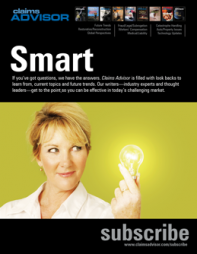 CASE: Claims Advisor magazine needed to reach not only its advertisers but also its readers and writers for various reasons—boost subscriptions, attract new advertisers, increase website traffic and solicit writers for contributed content. A series of ads for the industry websites and magazine was created that also tied into the look and feel of other key collateral. Increased response was measured in each category, particularly advertising.